Fridge Freezer Features Explained - Which? 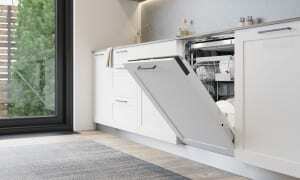 Find out which fridge freezer features are worth seeking out - and which you can live without. You probably don't think of fridge freezers as being particularly hi-tech products. 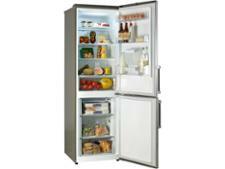 But even the most basic models come with some features, while a top-end fridge freezer is packed full of them. We reveal the typical features on offer at every price point, so you know what to look out for in the shops. Features can make a fridge freezer easier to use and clean, nicer to look at and even more effective at storing and preserving your groceries. However, they can also push up both the purchase and running costs, so it pays to think about which features you will actually use. Don't assume that high-end models with loads of features are actually good at the essential tasks of chilling and freezing quickly and efficiently. The opposite is true in some cases, so make sure you check our list of the best fridge freezers. Every fridge freezer has a climate class. This lets you know the range of room temperatures it can work in. Make sure your fridge freezer has a climate class of SN, SN/ST or SN/T, as these are the only appliances designed to work in rooms that reach 10°C, and are therefore the most suitable for UK temperatures. Even then, our tests reveal that some fridge freezers are better than others when it comes to keeping a safe and steady temperature on a cold night or during a heatwave. Use our fridge freezer reviews to pick one that will keep a constant climate no matter what. Choose a fridge freezer with glass shelves in the fridge, rather than wire ones, to prevent food and meat juices dripping onto items stored on the shelf below. Adjustable shelves allow you to configure the fridge space that works best for you. You can also create more room for bulky items, such as the Christmas turkey, as and when you need it. 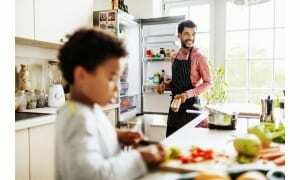 Most models have a single, manual thermostat for setting the temperature in both the fridge and freezer. The numbers 0-5 on the dial relate to power levels, rather than °C temperatures. To lower the fridge freezer temperature you would turn the thermostat up to increase the power - making it run colder. Most fridge freezer instruction manuals come with a recommended thermostat setting - but our tests find that following these often doesn't lead to ideal temperatures for keeping food chilled or frozen, so your food could be warmer than it should be. So we’d recommend checking the temperature in both compartments with a separate fridge/freezer thermometer to be on the safe side. A control panel can make it easier to set up your fridge freezer, although it’s not an essential feature. Basic control panels have a set of simple operating buttons and lights, such as an on/off switch and a power-on light. Go for clear plastic freezer drawers, rather than opaque ones, so you can see at a glance what you’ve got in your freezer. Basic models can have one or two salad crisper drawers for storing your fruit and veg. Two drawers let you store tender salad leaves and bulky vegetables separately. All refrigeration appliances need insulation to keep cool. This insulation is flammable, so it's essential that it is sufficiently protected in the event of a fire. The backing that protects this insulation is currently made from either plastic, metal or aluminium laminate, depending on the make and model you buy. Our tests have revealed that plastic backing can be highly flammable. We are therefore not recommending any appliances with flammable plastic backing. All fridge freezers with this type of backing have been made Don't Buys, regardless of how else they performed in our chilling and freezing tests. Watch our fridge freezer fires video to see what happens in a fire. Mid-range fridge freezers typically have one or more of the features listed below. Some of these will boost chilling and freezing, while others can come in really handy – without adding a fortune to the price. Take a look at our pick of the top five cheap fridge freezers. If you splash out on only one feature, make it a frost-free freezer. These are designed to prevent ice from building up in the freezer compartment, meaning you’ll never face the messy or time-consuming task of having to defrost it. In a 2014 survey of more than 1,000 Which? members, an incredible 97% rated this feature as useful. 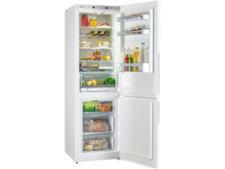 Prices are much lower than they used to be, too, with frost-free fridge freezers starting at around £200. A quick-chill switch gives a boost of cooling power to chill fresh food to safe temperatures quickly, helping it stay fresher for longer and keeping nutrients locked inside. You switch it on when you put a lot of fresh food into your fridge at once - for example, after you've just done a big grocery shop. The fast-freeze function works in the same way to freeze fresh food quickly. This means food will be fresher when it’s defrosted and will have retained more nutrients. Fast freezing also prevents the texture of some food – bread, for example – from changing too much. If your fridge freezer doesn’t have a fast-freeze switch, you can turn the thermostat up to increase freezing power. But remember to turn it down again, though, or you’ll waste energy. If you go away a lot, a holiday (or vacation) mode should help to keep running costs down. This setting is designed to set the fridge to a warmer and more efficient setting on the assumption that you're unlikely to have fresh food, such as meat or vegetables, in the fridge while you're away for anything more than a few days. Food in the freezer should remain safely frozen when the holiday mode is enabled. Find out which are the most energy efficient fridge freezers. Some models have a fan inside to circulate cold air through the fridge. This helps create an even temperature across the shelves, meaning food is less likely to spoil in warm spots or icy patches. These have buttons and switches for all the functions in one easy-to-access place. Most control panels are positioned at the top – either on the inside or outside – of the fridge freezer. Some have electronic thermostat controls, allowing you to raise or lower the temperature at the touch of a button. Others have lights to let you know which features are switched on – so you know whether it’s in fast-freeze mode, for example – and warning lights to let you know if you’ve left the door open or the temperature in the freezer is rising (see ‘high-temperature and door-open alarms’, below). These allow you to make the most of door storage space to hold bottles, jars and cartons. For example, you can lower the bottom rack to create enough space for tall bottles of wine or soft drink, or lower a middle rack so there’s enough room for cartons of fruit juice and jars of mayonnaise. The bottom door rack should be deep enough to comfortably fit a four-pint bottle of milk, but this can leave slimmer glass bottles rattling around whenever you open and close the door. A sliding door-rack divider holds bottles fast. Rubber bottle grips or ‘fingers’ work in the same way. These are ideal for storing ice-cube trays flat or for freezing soft fruit – such as raspberries – fast to help them retain their shape and texture when they’re defrosted. Once frozen solid, they can be bagged and kept in the main compartment. 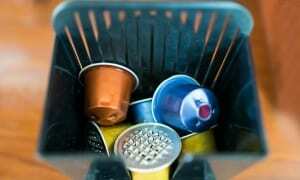 These make the fridge freezer easier to move – if you want to clean behind it, for example. Today's fridge freezers come in a range of colours and finishes, so you can pick the style that best fits your kitchen. White is nearly always the cheapest colour so, if your budget is tight, look for a white version of the fridge freezer you want. However, it shouldn’t cost too much more to get a silver or black version. Stainless or brushed steel, brushed chrome and aluminium finishes look stylish and will cost a fair bit more. Bear in mind that metal finishes aren’t fingerprint-friendly and you may find you have to polish it regularly to keep it looking good. Even more colourful options are available from some brands. Take a look at our Gorenje and Smeg fridge freezer reviews. These are suspended between fridge shelves and offer a place to stow bottles safely. Bottle racks stop bottles rolling around on the shelves, or taking up premium storage space on the shelf. Most racks are removable, so you can take them out if you prefer to keep all your bottles in the door racks. Half-width shelves or shelves that can fold back on themselves allow you to stand tall bottles on the shelf below. They can be useful if you like to keep milk in the main fridge compartment where it's not subjected to warm air when you open the door. These are extra drawers in the main fridge and are a perfect place to keep meat and fish extra cold and shielded from warm air when the door's opened. They also help contain meat and fish odours. Chiller cabinets are handy storage features, but they’re dependent on the general fridge cooling cycle to keep food chilled. Some top-spec fridges have chill compartments that are temperature-controlled to keep food chilled between -2°C and 3°C – no matter what the temperature in the rest of the fridge. These are ideal for keeping butter and dairy products protected from warm air when the door is opened. Some salad crisper drawers have a slider-switch that lets you control humidity levels inside the compartment. Slide the switch to the closed position to lock air and moisture inside, and keep moisture-loving fruit and veg – such as lettuce, carrots, broccoli and beans – fresher for longer. A high-temperature alarm beeps if the temperature in the freezer starts to rise, hopefully allowing you to fix the problem before you have to discard the contents of your freezer. And if you accidentally leave the fridge or freezer door ajar, a door-open alarm will remind you to close it. Some models have these for both fridge and freezer, while some have alarms for just one compartment. Others have warning lights on the control panel. 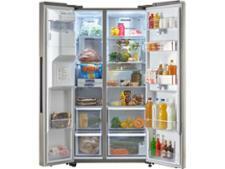 Top-of-the-range fridge freezers have many of the features listed above, plus a few extras. These allow you to set the fridge and freezer temperature individually to create the perfect temperature for both your chilled and frozen food. With single thermostats there's a risk that when you set the right temperature for the fridge (3°C to 5°C), the freezer could be too warm or too cold. These are LED displays on the door of the fridge freezer, which look great. They allow you to set the temperature and control all the fridge freezer’s functions at the touch of a button and in one place. This is a dedicated compartment that can be set to between -2°C and 3°C. Keeping raw meat and fish chilled at 0°C can prevent harmful bacteria from growing and helps keep it fresher for longer. These give you chilled, filtered water and instant ice – either crushed or cubed – and are usually found on larger models or American fridge freezers. Most have to be plumbed into the mains water supply. 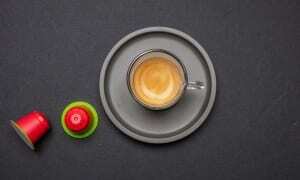 This will affect where you can put them in your kitchen and makes them expensive to install. The filters will need replacing every six to 12 months at a cost of £20 to more than £90 each, depending on the brand. Some models have removable water jugs that you fill from the tap. This means you can put them anywhere in your kitchen, but you’ll only get 2-3 litres of water before you’ll need to refill the jug. These are dedicated ice drawers in the freezer. You fill the removable compartment with water. Then when the ice is ready you twist the dial to release it from the tray, making banging ice cube trays against the kitchen worktop to release stubborn cubes a thing of the past.